Nintendo have announced three more 3DS Titles are joining the Nintendo Selects range in Europe. 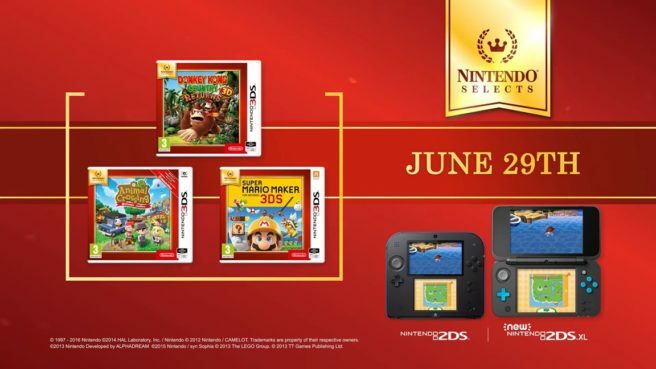 Animal Crossing: New Leaf – Welcome amiibo, Donkey Kong Country 3D and Super Mario Maker 3DS will be added to the Nintendo Selects range on June 29th. That’s not all though, Two new 2DS XL bundles have been announced as well. Both come with a pre-installed game. The lime green and black 2DS XL is bundled with Mario Kart 7 and the Lavender and White 2DS XL comes with Tamodachi Life. These bundles will also be releasing on June 29th. Nintendo have also uploaded a new trailer to their YouTube Channel featuring the three new additions to the Nintendo Selects Range. You can view the video below. To finish off, we also have the official European Press Release which, you can check out below. 23rd May 2018 – For those who wish to discover a game they may have missed the first time around, or simply wish to rediscover it, the Nintendo Selects range and its wide variety of gaming experiences is the ideal place to start. There are already plenty of titles available to enjoy as part of the range, including SUPER MARIO 3D LAND, Kirby: Triple Deluxe, and Luigi’s Mansion 2 for Nintendo 3DS family systems. Animal Crossing: New Leaf – Welcome amiibo– Moving to a new town and making new friends is a big step… but it’s even bigger when you’re the mayor! Get ready to enjoy a whole new life in a town shaped entirely by you. You can use Animal Crossing amiibo cards and figures to invite animals to your village, help you out in minigames or get new items.